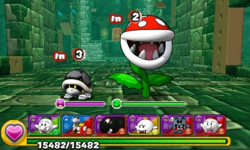 World 8- Tower 2 is the eleventh course of World 8 in Puzzle & Dragons: Super Mario Bros. Edition. It is a tower level with enemies consisting of Bony Beetles, Piranha Plants, Yellow Koopa Troopas, a Big Bony Beetle, a Big Bone Piranha Plant, Blue and Green Magikoopas, and a boss fight with all five Magikoopa types. This is the only tower course in the game not to have Boom Boom or Bowser Jr. as the boss. This level is straightforward: the player faces five battles before the boss fight with all five Magikoopa types at the end. ★World 8- Tower 2 is a difficult version of World 8- Tower 2 from ★World 8, with Heart Orbs disabled from the Orb field. Interestingly, the Blue and Green Magikoopas switch places for the boss battle. 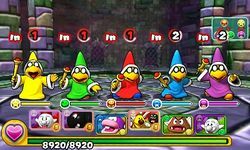 The boss battle with all five Magikoopas.